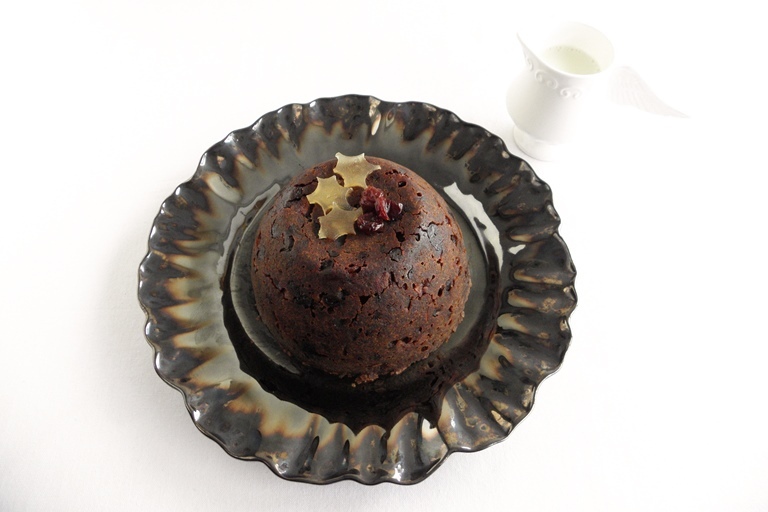 Howard shares his delicious recipe for dairy- and gluten-free rhubarb and Armagnac plum pudding, a superb Christmas pudding recipe that everyone can enjoy. The label on my bottle of Armagnac boasts flavoursome notes of prune and vanilla, making it the perfect Christmas spirit for this sumptuous gluten-free pudding of… well… prunes and vanilla. Rosy rhubarb is forced into the shops just in time to bring something a little tarty to the party. I’m a sucker for unusual fare, but you can easily replace the coconut sugar and quinoa flakes with more standard ingredients, and feel free to tweak the spices – although if you’ve never used Chinese five-spice in a plum pudding, don’t knock it until you’ve tried it. If you need a nut-free pudding, omit the flaked offenders and replace the ground almonds with desiccated coconut or more quinoa flakes. Gluten-free suet can be tricky to track down so I use a block of white vegetable fat, frozen then grated. It’s a finger-numbing process and you’ll never get the full amount in your bowl, but don’t worry unnecessarily – it’s Christmas. If your pud doesn’t need to be dairy-free, you could grate frozen unsalted butter if you prefer.